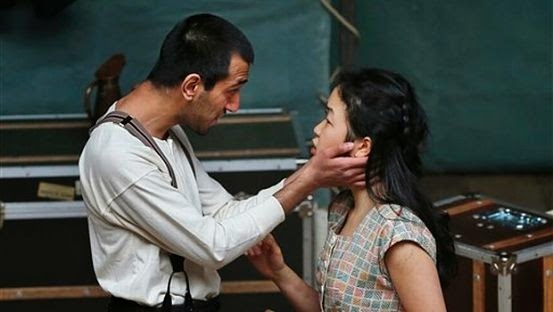 A SECRET PASSION: Naeem Hayat playing Hamlet opposite Jennifer Leong cast as the tragic Ophelia. Perhaps the most astonishing thing about the Globe Theatre's recent performance of Shakespeare's most popular tragedy Hamlet at the Little Theatre is the resourcefulness, minimalism and innovative creativity that went into the staging. Grips and cases doubled as seats and other stage properties; performers carried out their own scene changes mid-performance; banjoes and other makeshift instruments added a whimsical jolt of musical bliss to the whole thing. Each of the actors delivers a fine performance, but there's something to be said for Naeem Hayat's central performance in the titular role — kinetically energetic and so passionately realized that one can only conclude that there was indeed method to the Danish prince's madness. Kudos are in order, too, for Rawiri Pantene, whose pitch-perfect take on Polonius made me believe there was no firmer or more convincing way to deliver classic lines like "To thine own self be true" and "Brevity is the soul of wit." This small-scale production, directed by Dominic Dromgoole, playing to some 205 nations through 2015 (Jamaica was stop number 38) eschews old-school traditional style in favour of a more unorthodox spin imbued with a sort of hippie-gypsy aesthetic mixed with Shakespeare's genius and flair for language all ablaze. As the show heads off to the Dominican Republic and Haiti and South America, devoted Shakespearean purists needn't worry; the Globe's sparingly staged Hamlet — whose Big Themes of honour, vengeance and unrequited love are epically examined — still provides an enormously satisfying evening at the theatre, anchored by a richly modulated lead performance.